The battle of Karnakus Secundus has been at a standstill for far too long. 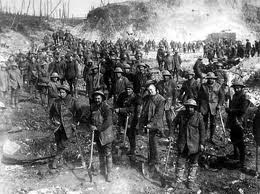 Life along the battle line is harch and guardsmen die everyday in there foxholes. Some of enemy bombardment, but most of them through sickness from toxins in the air combined with the lack of fresh water and food. The high ranking officers of the 981st army don´t suffer the missery of a simple guardsman, but new disquieting intelligence reports tells high command that something has to be done. The reports says that the Chaos force has the STC running and there is a chance that they could start using it to enforce there strength. There have been no reports the last month of the enemy strengthen their lines. 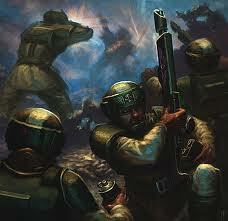 The chance is that their armed resources are at the limit and fresh Imperial guardsmen are still being brought to the front. Armour and munitions depos are high. And good news are that the forces of the imperium have had reenforcements from the mighty Astartes. A full company of Ultramarines that have urged themselves to Karnakus to support the cause! It is time for the army of the Emperor to strike. High Command under Lord Commander von Herth can not hope to take Millas in one single battle. The risk of being surrounded and destroyed is to big. The total victory is still far away. The goal with the attack is to take control over a vital position in the Chaos defence lines. The small outpost of Fort Hope. It´s not only a key to the Chaos left flank, it´s also an important water suppliant to the Karnakus capital. Fort Hope is a heavy defended outpost east of the Settlement Hope. It lies in a rough country. 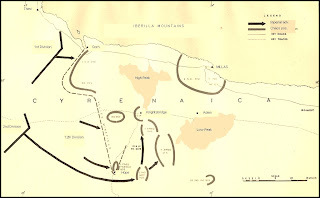 A frontal attack in force would leave the army open to counter attack. 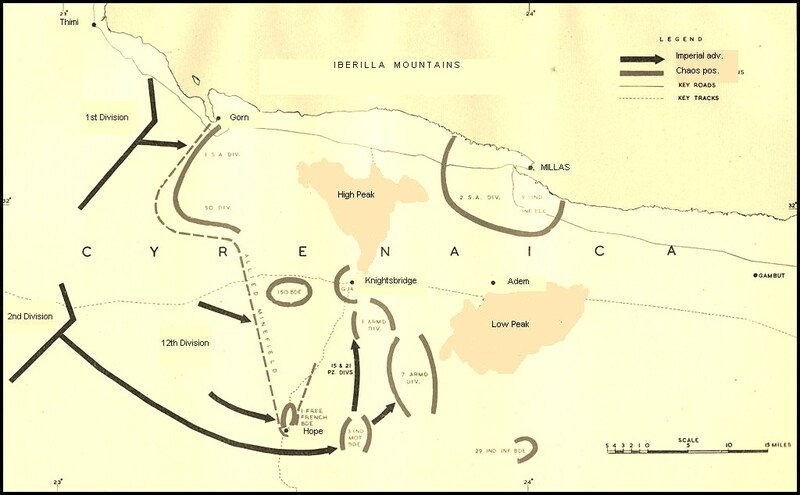 Instead the army is to attack on several places along the Chaos defence line. The 1st Division is to attack the Chaos strongpoint at Gorn to tie up the enemy and preventing them to send reenforcements along the line. 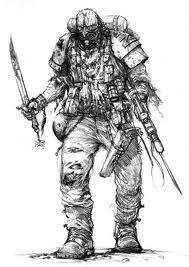 12th Division is to attack the Chaos center at several places to force the Chaos to strech their line thin. With some luck the majority of the Chaos forces at Fort Hope will abandon the outpost to support the weak center. Meanwhile elements of the 2nd Mechanized Division will race ahead around the Chaos left flank and begin a frontal assault on Fort Hope. The battle plan is clear. 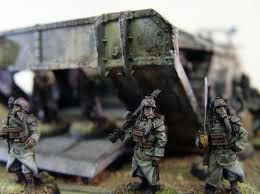 The 19th and 201st Cadian and the 314th Krieg siege regiment will make a armoured assult on Fort Hope along with the mighty Ultramarines supported by mighty war engines of the Imperial armour. When Fort Hope is secured the two Cadian regiments will spear forth attacking fortified positions below the two mountains High Peaks and Low Peaks in order to win time for the Krieg troops to fortify the outpost. The battle has begun and the Chaos forces swallows the bait. The majority of the troops stationed at Fort Hope are commanded out to support the centre. Assult wessle upon assult wessle of the 2nd division is speeding towards the outpost. But suddenly they are commanded to a complete stop b the Astartes captain. 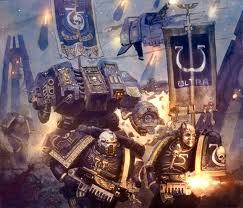 The Space Marines landspeeder scouts reports that the 2nds movement has been noted and that a larger force from the Chaos army is coming their way, and they are accompainied by the First Sons the hated traitors and blood enemies of the Ultramarines. The attack can not be stopped now. It´s going to be a bloody battle at Fort Hope! The death of all those imperials. It is an offering to the gods! It feels like the day before Christmas. And it's going to be a red Christmas, coloured by the traitors blood. I hope he did otherwise the battle would be to easy for us to win. By the way, this time we are also accompanied by two master gamers.